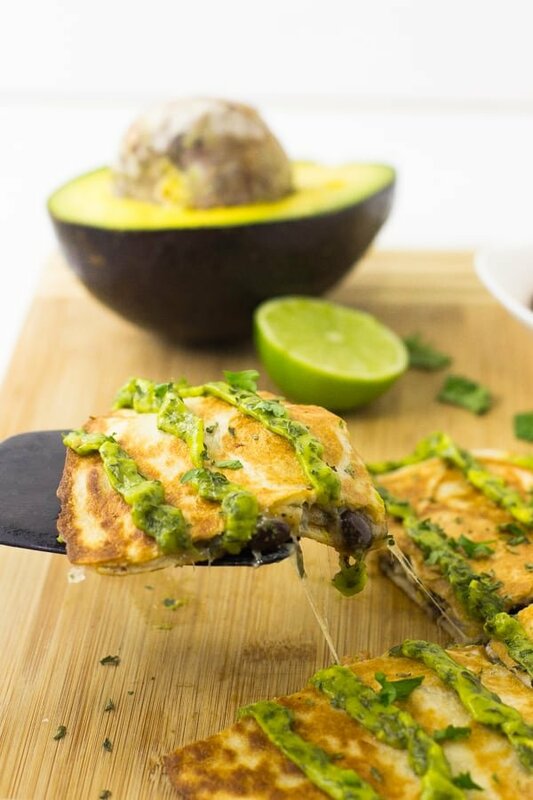 Mexican Quesadillas with Avocado Cilantro Cream Sauce + Giveaway! 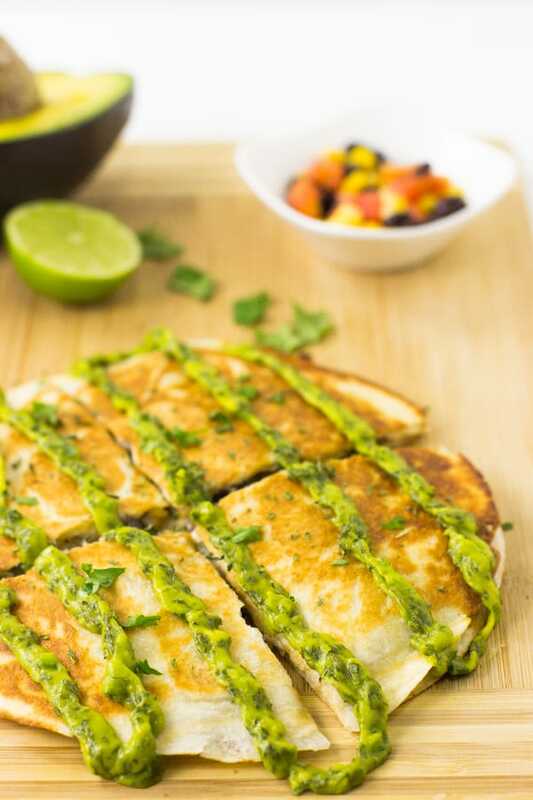 … These Mexican Quesadillas with Avocado Cilantro Cream Sauce are a quick, easy and delicious weeknight meal that’s creamy, crispy and tasty! Am I the only one already in full Valentine’s Day swing? I don’t mean just the sweet side – I mean everything “for two”. My wedding is in about 150 days (whoa!). I’m going to fit the dress next month (double whoa!). For some reason, my brain seems to be in a “for two” mode. For February I’m trying to focus on the less sweet side of Valentine’s Day. So, things like breakfasts, dinners and maybe one sweet treat since we gotta eat food too! 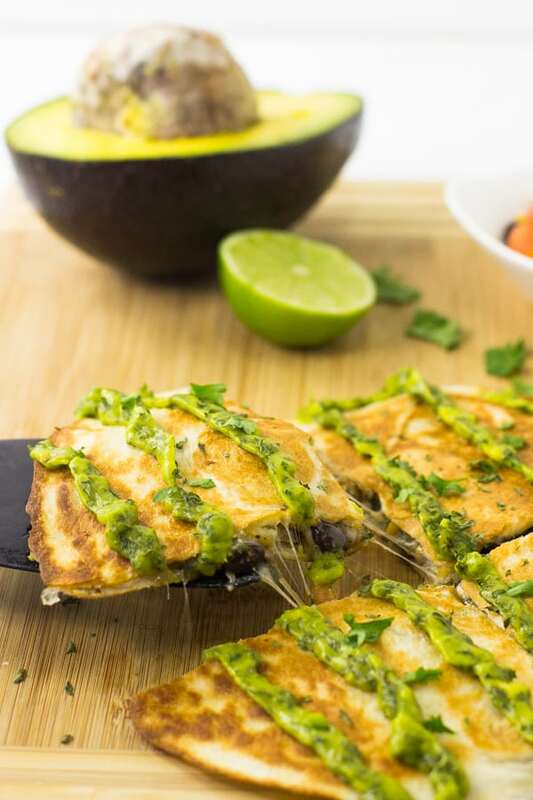 This quesadilla is perfect for a quick appetiser for two if you’re really into great, easy Mexican food. Speaking of February, a slight change on the blog. I’m going to be blogging twice a week for the next few months. With the wedding planning in full swing, I find myself barely able to find any time to do anything. I want to ensure that the posts I come out with are still of quality for you my readers. So you’ll be seeing a little less of me a week but still a whole lot of me! Now, to these quesadillas, and tying in the GIVEAWAY! I’ve been embracing my vegetarian self 100% and eating all things Mexican. These quesadillas come together so quickly that I’ve been making them for lunch. In 10 minutes I get a gooey and creamy on the inside, crisp on the outside, and avocado-y goodness topping. The filling is basically the same for my black bean salsa and can be put together ahead of time in the fridge. Spread it on the inside with some Greek yogurt and garlic powder (my healthy alternative to sour cream). You can then add some cheese and pop it onto a grill or a panini machine like I do. You can close it or flip it to get the other side nice and crisp. Then top it with some avocado cilantro cream sauce which is just creamy avocado, chopped cilantro and lime juice and you have a delicious quesadilla. The Mr. and I shared two pieces each and by two pieces each. I mean I had one of his plus mine *oops* as an appetiser or you can eat everything for a full meal. Either way, you eat it, it’s going to be totally delicious. Inspired by the traditional Chinese cleaver, the Chai Dao’s extra wide blade and razor-sharp fine edge has a rounded tip to facilitate “rocking” motion on cutting boards. Its new hollowed-edge helps prevent sticky foods such as raw potatoes from adhering to the blade. This was one of my favourite knives to DATE (we kind of LOVE a great knife over in this household). It’s the perfect addition to your collection! I’ll have all the giveaway details below so be sure to enter! Thanks so much to WÜSTHOF for sending me a knife and graciously sponsoring this giveaway! If you try these Mexican Quesadillas with Avocado Cilantro Cream Sauce please let me know in the comment section below, or tag me on instagram with the hashtag #jessicainthekitchen! For more exclusive recipes follow me on Instagram AND on Snapchat: jessinkitchen. Preheat a greased panini machine, or a indoor grill or even a large pan to medium heat. In a bowl, mix the corn, tomatoes, black beans, parsley, cumin, and chili powder. Add the salsa and mix to combine. On one of the tortillas, spread the entire greek yogurt and garlic powder mixture. Add the black bean mixture to the top of the tortilla. Spread the cheese on top and top with the other tortilla. Place on the heated machine to grill until crispy, about 3 minutes, and then flip. NOTE: If you're having trouble flipping, you can slide it on to a plate then flip it in the plate then place it back onto the machine. Alternatively, you can use a tortilla wrap twice the size and just fold in half for a top and bottom. When crispy, remove from the machine and place onto a plate. Cut into four equal pieces and top with Avocado Cilantro Cream Sauce. You can store these quesadillas in the fridge in a tupperware container or tinfoil for no more than 3 days. To reheat, you can pop them into the oven for 5 minutes in the tinfoil at 350 ° F/ 175° C.
The first thing I’d like to cut are some roasted beets in little matchsticks to make a salad with brown lentils! I always love your vegetarian blog posts Jess! Keep doing an amazing job! Plus, I’d use that wusthof knife like I use the rest of my knives in my collection: on almost everything especially my sushi & prep work. Our family likes to eat stir fries so I would use it to cut up a lot of vegetables. I would cut some avocados for guacamole. This sounds sooooo soooo good! I must try it! Hi Jessica. 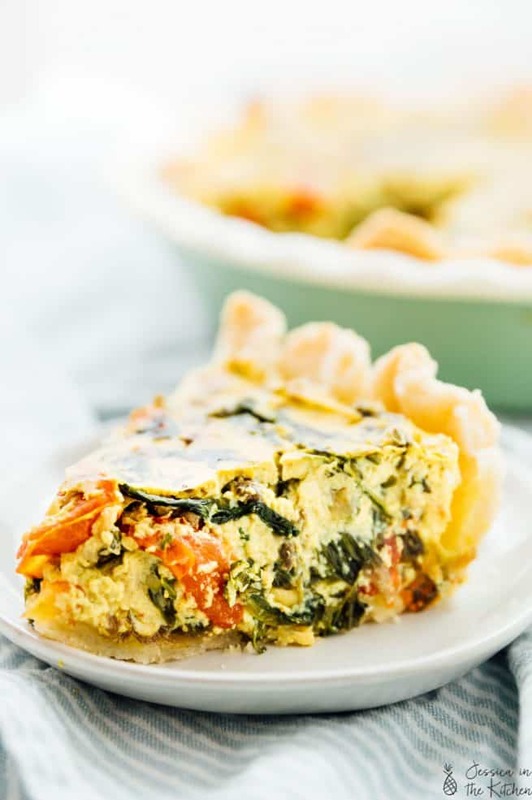 This recipe would be perfect for a quick and easy lunch. I love black beans, but need to start eating them much more. Sweet potatoes! I chop them multiple times per week for meals and they always leave my hand so sore! I have such a soft spot for quesadillas! 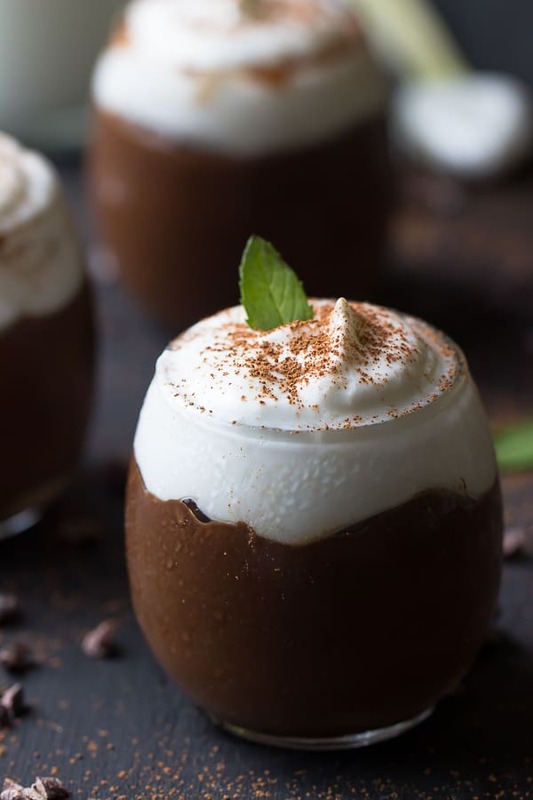 I just had some on thursday night and would eat more right this second haha These look delicious! What a super amazing giveaway! I would use it to chop a bunch of fruit for a upcoming get-together! The sauce looks and sounds delicious. 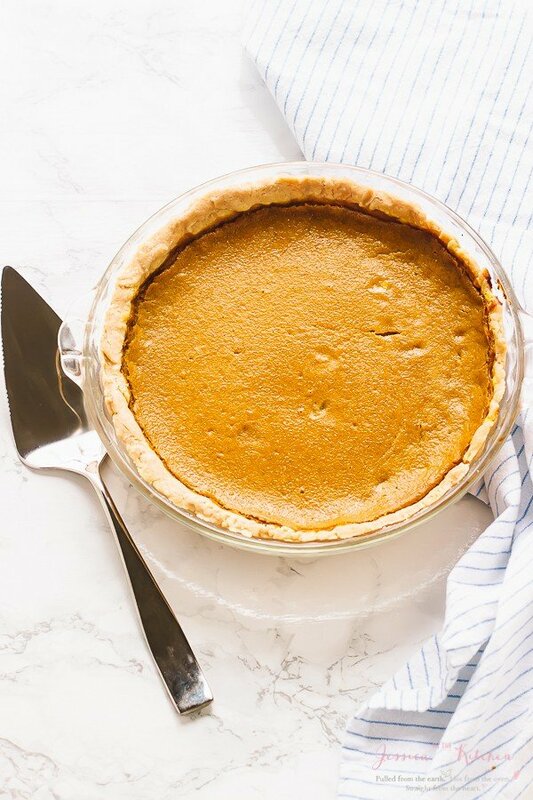 I just had to get on here and say that our whole team here at Illinado Home Solutions, LLC loves this recipe ever since we saw it on your site. Even Remodelers enjoy your topics! Hello! Someone in my Myspace group shared this site with us so I came to give it a look. I’m definitely enjoying the information. I’m book-marking and will be tweeting this to my followers! Excellent blog and fantastic style and design.